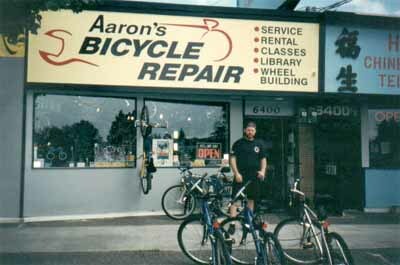 The history of Aaron's Bicycle Repair, Inc. Since our founding in 1997 we have moved 4 times. Our 5th and final location in White Center. 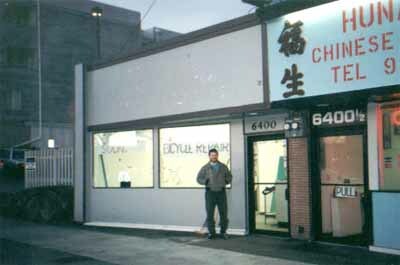 I opened my shop on April 7, 1997. It was a nice sunny spring day. I had spent the previous month remodeling the inside of the place, putting up display wall, building my workbench and installing carpet. The space I rented was only 290 square feet. I only had room to store 6 bikes at a time and one repair stand. You can still see where the old wall was at the shop today. It was located where the current row of wheels is on the ceiling. My wife, Gypsie, would help me out on weekends ringing people up. I also had paint the store front. I took one last mini vacation to Oregon just before opening day. When I came back the sign was up. I remember the proud 'wow' feeling I had when I first saw my name on the front of the shop. It was a little embarassing seeing my name that big! Trying to think of a name for my shop was not as easy as you might think. You want something people will remember but still says bikes. 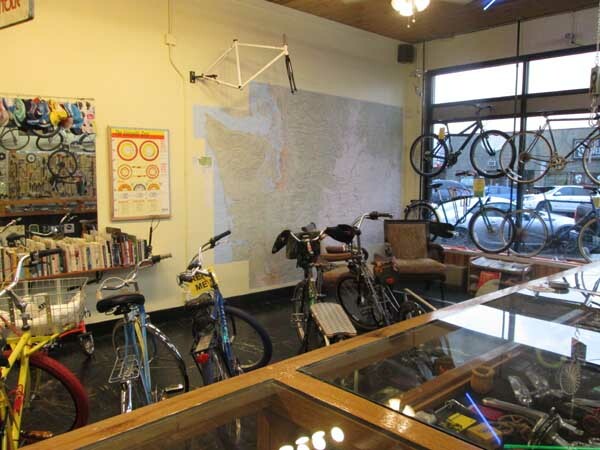 West Seattle Bike Shop? Too generic. Cosmic Cycles? Too far-out (I also love astronomy). 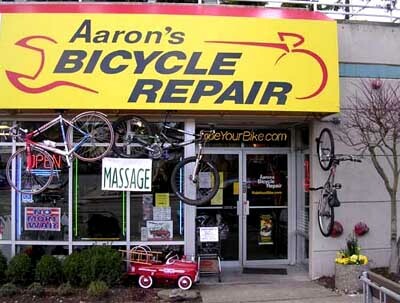 Of course I thought of using my own name Gypsie suggested I would be first in the phone book, so Aaron's Bicycle Repair it was. In the end we decided that reputation and atmosphere was more important that what the shop was called. 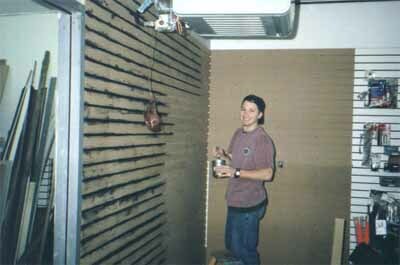 In the late winter of 1999 we expanded the store. I hired my first full time employee, Chad Palmer. We built a second workbench, a dressing room and moved the wall back 40 feet. We tried to recycle as much as possible. I wanted a rustic look to the bike shop but it didn't work out exactly as planned. The Old Front Porch (OFP)is made entirely out of recycled and found materials. It was a challenge finding the tin roof rusted! My original idea for the OFP was to have a cool place to hang out and surf the internet or drink a cup of coffee while you wait for your repair. Pressure for space to sell product pushed out the internet lounge but you can still check your email or a website at one of our shop computers. Just ask! Today the OFP is used for our office but we kept the couch and library. We even have kid's toys and books. After a few great years Chad took a job with Browning Transmissions and was replaced by Mike Herring. Mikey came to us from Hilo, Hawai'i, our vacation town. It was a total coincidence! Mike says he even rembers me coming into the bike shop he worked at there. Small world. 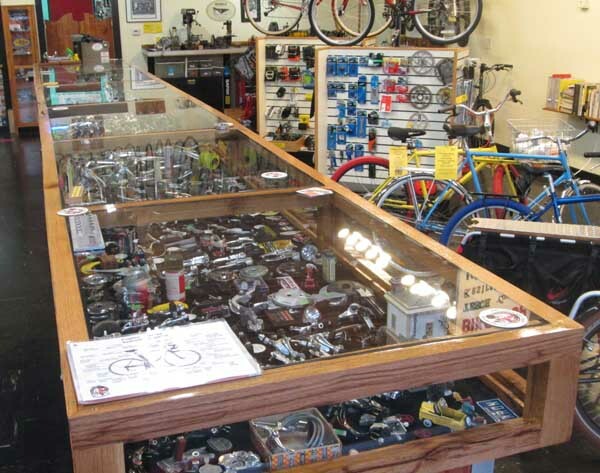 People often ask me how I started fixing bikes or how I got to where I am; runing a bike shop. Here is the brief version. I started fixing bikes in the basement of my house when I was 14. We lived in Oregon City, Oregon. I hung out at the local bike shop and the city library and read any book I could find on bicycles. My first was Anybody's Bike Book. I sell copies of the current revised edition. 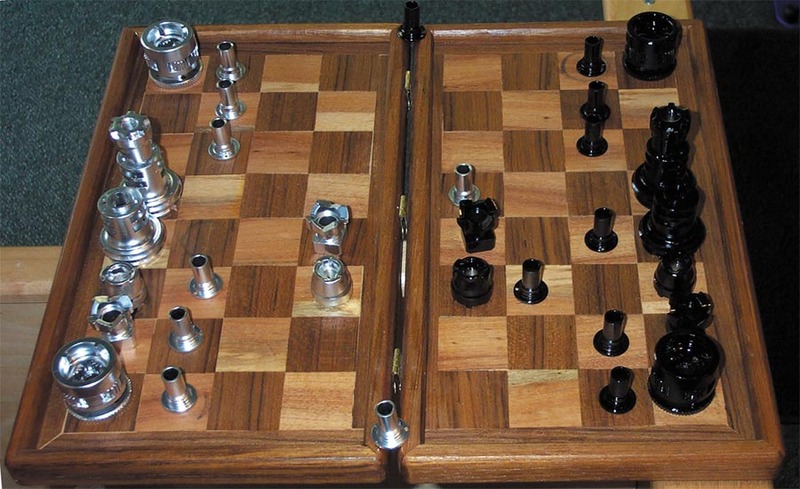 I learned through trial and error and a lot of reading. I love exploded diagrams! 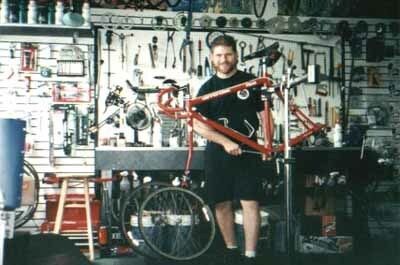 My first apartment was half bike shop. We had a repair bench in the living room and bike posters on every wall. I pestered my favorite bike shop, Strawberry Cyclosport, in downtown Portland. Finally they hired me. I was really happy! After 6 months the shop closed down and I had to find different work. Then my big break came. A friend saw an ad in Northwest Cyclist (now Sports Etc.) for a mechanic job in Seattle. 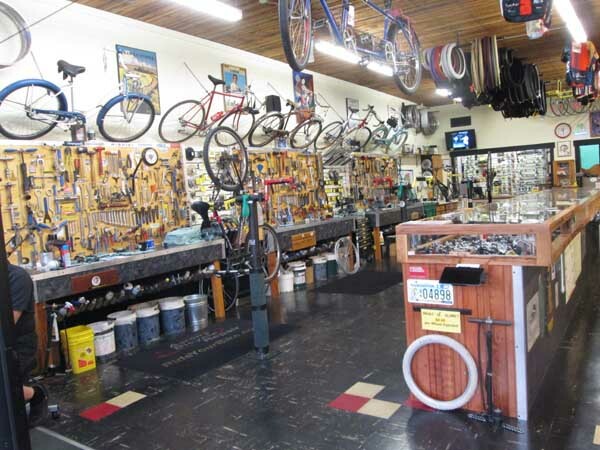 I worked at Montlake Bicycle Shop for 4 and a half years and quickly advanced to Service Manager. 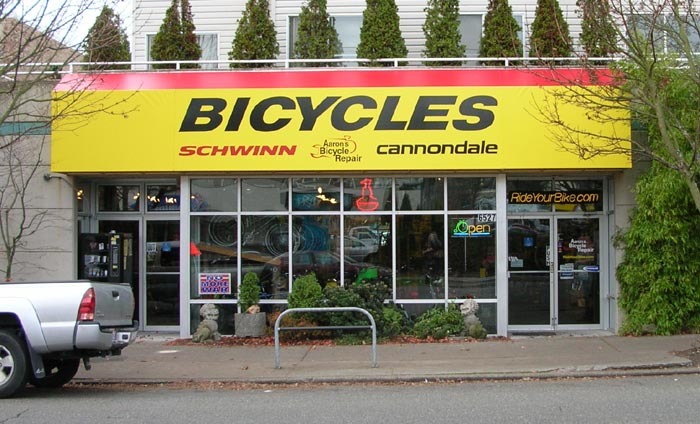 After Montlake, I worked as Service Manager at Alki Bicycle Company, then I took job as the only employee at a little barn on Vashon Island called The Bike Shop. It was out in the sticks, really desolate! I managed to grow the business and after about 2 years, I purchased the store with 3 of my customers. Partnerships rarely work smoothly and 9 months later I sold my shares of the store to the other 2 remaining guys. One of them, Jeff, still runs the store. We changed the name to Vashon Island Bicycles. Funny how life works. All of my experiences, now that I look back on them, seem to have been grooming me to open my own shop someday. I live a dream. Sometimes a nightmare with taxes, tough customers or employees, but usually a really good dream. I am still learning! 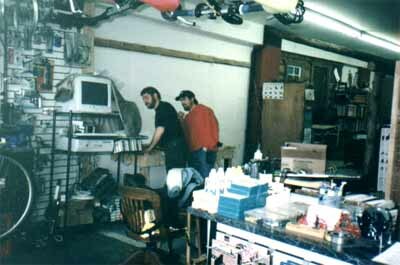 Our biggest expense and challenge came in January of 2004 when we moved the shop. Aaron got the flu on the day of the big move. Stress really causes illness! Then everyone else except Michael got it. After it was done it was amazing to look around and realize how big of a chore it was. It was way harder than moving a household, because we moved all the display wall and even the Old Front Porch. We moved again in November of 2008 into the old liquor store space. They did not renew their lease and were leasing month-to-month. We needed the space and so we kicked them out! Sorry, about that. Little did we know 4 years later you would be able to buy booze right across the street. Our shop is now more than double in size with an open floor plan and lots of room to move. Our fitting area is exanded and we stock complete bikes on the showroom floor. We also have plenty of room to sell cargo bikes (one of our loves). The kid's play area and libray have an entire corner with a couch and you can play vintage Atari games! We have much nicer music system, so request a song! Our shop cats, Presta and Schrader, have more room to chase toys and our employees love the new kitchen/employee lounge. We kept the same decor. Blue sky ceiling, green grass floor. The shop is clean and bright, but still smells like bike tires. In late 2012 the landlord wanted to increase our rent to $7000 per month. That and the increasing onlsaught to our sales from online discounters forced us into and emergency situation. It was either move or go out of business. We tried to negociate with our landlord to downsize the space by splitting it with a wall. A tenant the would approve of could not be found. No pot shops, no tattoo shops, nix on the triftstore, etc. And they wanted us to pay for the total cost of the wall, a building improvemnt! Finally, they let us out of the lease and gave us 2 months to vacate! We had heard that White Center was up and coming and that rents were affordable. We found a space for only $1300 a month in White Center Square next to Hung Long Asian Market. And we were right across the street from Big Al Brewing! 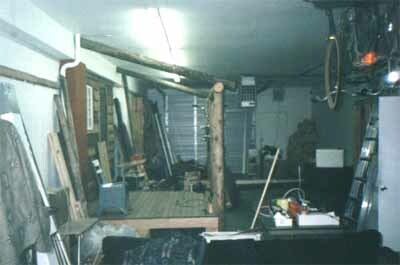 The space was about half the size we needed but we made due by building a loft above half of the floor space. When LUSO Food and Wine moved to Greenwood we coveted the space for 6 months before signing a 10 year lease in late 2016. We are very happy with the new location and the visibility. We are the most visible store front at night. We included 9 different languages on our store front sign. They are the most commonly spoken languages at home by the citizens of White Center. Our neighborhood is the most diverse in the country! About 30% of our customers do not speak English as a first language. We have a translation sheet for all the bike parts and we use Google Translate to communicate. The interior of the shop is unlike any of our previous locations. We decided to phase out slatwall and only have a limited amount. Instead we installed the World's Longest Display Case Bar! Customers and belly up with a coffee or beer and watch us work or just gaze into all the bike goodies. We also installed a huge 9 x 13 foot mural topographic map of Washington. It is a great meeting place to plan rides or discuss previous rides. We patched and polished the original tile floor with left over tiles from Proletariat Pizza. The ceiling is solid wood and gives us amazing freedom for hanging things. All posters are now mounted and framed. The shop is more open and classy than any previous location. We still have our book lending library. We have 2 easy chairs so sit back and read a book while we fix your bike.